Rose Coschignano/Pipe Dream Photographer Redshirt junior second baseman Alex Baratta had two hits and recorded two RBIs in Binghamton’s lone win of its series against Stony Brook. Good, but just not good enough. 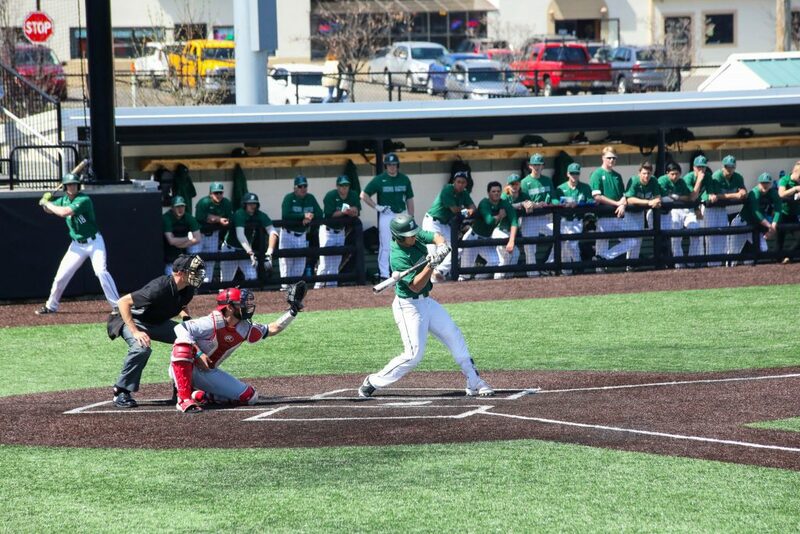 The Binghamton baseball team welcomed one of the best teams in the America East (AE) conference, the Stony Brook Seawolves, to the Bearcats Sports Complex for a three-game series over the weekend. The Bearcats (14-14, 4-4 AE) played well, but were not good enough to edge out Stony Brook (20-11, 9-3 AE) in the series, dropping two of the matchups. The first game of the series went down to the last inning and beyond, as Stony Brook pushed the game to extra innings in the top of the ninth and won 7-6. Most of the Seawolves’ runs came off a grand slam by senior infielder Brandon Alamo in the top of the fifth, which was set up after two walks and a single. Then, up two runs in the ninth inning, Binghamton was not able to put the Seawolves away, as it tied the game up and then cemented the outcome in the 10th inning. The second game’s story was pitching. Specifically, the performance of Binghamton’s best pitcher, junior Ben Anderson, one of the two best pitchers in the AE. Anderson leads the AE with six wins and has far more strikeouts than any other pitcher with 66. The next closest pitcher has 49. Anderson pitched an impressive, complete-game shutout, allowing eight hits and only one walk through seven innings, all while adding nine strikeouts to his stat sheet. The Bearcats were able to support his dominant start by plating five runs on six hits. The Bearcats faced several injuries during the last game of the series, missing several starting pitchers, as well as junior catcher T.J. Wegmann and sophomore shortstop Jake Evans. The Bearcats showed some fielding woes in the third game, as they fell 6-3 to Stony Brook in the rubber match. There were several hard-hit balls that were within reach of players who could not make plays, which accounted for Stony Brook’s five doubles throughout the game. Freshman catcher Connor Aoki did well for some of the game, throwing out a runner at second, but missed a throw to allow a runner to come home in the seventh inning. Redshirt junior second baseman Alex Baratta had another strong series, hitting a two-run homer in the second game against Stony Brook and overall going 4-for-11 with three RBIs throughout the series. Baratta continues to maintain the best batting average on the team and the fourth-highest average in the AE at .365. BU had been playing well of late, winning five out of the last six games, with the only losses coming in the extra-innings loss in the first game of their doubleheader Saturday and the loss on Sunday. It had a three-game winning streak against nonconference schools before coming into its second conference series of the season against Stony Brook this weekend. Binghamton gets a break from conference play as Marist College comes to visit the Bearcats for a single game on Wednesday, April 17. First pitch is scheduled for 4 p.m. from the Bearcats Sports Complex in Vestal, New York.